Ever been broken-hearted and needed somewhere to go? Whether you’re in a relationship and need a temporary escape, or you’re lost without love and in need of shelter, Mace and Burton welcome you to Heartbreak Hotel. Join them as they chat to guests from across the Fringe in this cathartic comedy chat-show exploring heartbreak, heartache and those heart-warming moments that make it all worthwhile. Have a hope-filled holiday for the heavy-hearted! 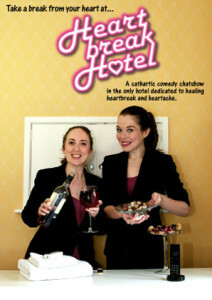 Read more about Heartbreak Hotel including previous performances and reviews on the Mace and Burton website.